Woman stabbed outside supermarket has blade taken out of her spinal column; hospital provides update on improvements of terror victims. A complicated surgery was completed Wednesday night on the woman who was stabbed in the back by an Arab terrorist in Gush Etzion earlier in the afternoon, during which the knife's blade was removed from her spine. After being stabbed and moderately wounded, the woman was evacuated to Shaare Zedek Hospital in Jerusalem with the knife still in her back, where she underwent the surgery. In a delicate procedure, the knife was removed from where it was stuck in her spinal column. She was then given additional checks to estimate the extent of the wound and the required treatment. Her attacker was driven from nearby Hevron to the Rami Levy supermarket at Gush Etzion Junction where the attack took place by a taxi driver, indicating possible cooperation from others in Hevron according to regional leaders. In response to the attack outside the popular retail chain branch, IDF and regional leaders held a meeting and decided to launch a bevy of new counter-terror measures including an increase in security deployment. The woman is one of many Israelis currently being treated in the capital as a result of countless Arab terror attacks. 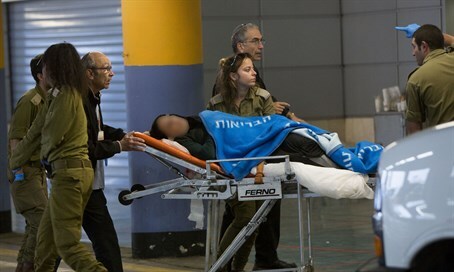 Hadassah Ein Kerem Hospital in Jerusalem on Wednesday night updated the status of several terror victims. A 20-year-old soldier wounded in a car attack last week on Highway 60 has recovered, and is now defined as being lightly wounded. Three-year-old Tahel Sofer, who was burned in a firebomb attack near Beit El in Samaria, continues to suffer from burn wounds but is now listed as lightly wounded after also making progress. Female IDF soldier Dakla Magdish, who was stabbed at Adam Junction in Samaria's Binyamin region last week, is suffering from moderate wounds after being stabbed in the upper body and neck. Her condition is improving according to the doctors, and it appears she will make a full recovery. The soldier is currently able to communicate with the medical team and her family. A police officer who was critically wounded in an attack at the Damascus Gate of Jerusalem's Old City has been transferred from the hospital to Shaare Tzedek Hospital. The officer is currently in serious condition, but is no longer anesthetized and asleep.